Editor's Note: Following the recent article by Steve Austin, of the Emergency Responder Safety Institute, on rear apparatus visibility, the organization's Director of Training, Jack Sullivan, now looks at some additional ways to improve the conspicuity of your fire apparatus. Some people on apparatus committees spend loads of time discussing what warning devices should go on the front of fire apparatus. They argue about how many and what kind of lights should be there. They discuss the location and placement of the venerable "Federal Q" and some of you (and you know who you are) are persistent about the location and number of Roto-Rays that will be on the front of the rig. Yet in many cases committees simply accept whatever the manufacturer suggests for safety and warning devices on the rear of the apparatus. But there are some interesting and innovative ideas surfacing to improve on-scene safety for your personnel. Roadway incident response safety procedures call for fire apparatus to park on an angle at an incident to block the work area and protect responders and victims at the scene. Then, the wheels of the apparatus should be turned away from the incident so that if a vehicle hits the emergency unit, it will be pushed away from the personnel working at the scene. But how many of you have taken the time to evaluate how your apparatus looks from the rear when parked at an angle? If you have flat-faced strobe or LED lights on the rear, do they provide adequate warning when the truck is parked at an angle? Have you looked closely at how effective the amber-colored arrow device is when parked at an angle? Some arrow-type warning lights are so small they are difficult for motorists to see and understand when the truck is approached at high speeds. The arrows become even less effective when the rig is parked at an angle. A more proactive design calls for emergency lights to be mounted up high on the back of the rig to provide 360-degree visibility. Emergency lights, visible from any angle, mounted high on the back end will be effective for any position the rig can assume at an emergency scene, as seen in Photo 1. The newer strobes and LED lights are very effective at getting attention. However, rotating or flashing lights can sometimes offer better depth perception and assist approaching motorists to get a better sense for exactly where your rig is located. Properly designed and angled LED lights and 360-degree strobes can also be effective if installed with various truck parking positions in mind. There is evidence that suggests that amber lighting on the rear of apparatus can be very effective at warning motorists while reducing the rubbernecking that often occurs around emergency scenes. Amber lights are "boring" and to most people signal caution for construction, roadway hazards or disabled vehicles. While red and blue lights may signal more "authority," they also attract loads of unwanted attention. NFPA standards for new fire apparatus do allow for amber warning lights on the back of apparatus. Fire departments currently using them attest to their effectiveness at conveying a message of caution while reducing the effects of distracted drivers as they pass by the scene. Not only can you specify amber warning lights for new apparatus, but in many cases it can be a cost effective and easy retrofit for existing vehicles to improve firefighter on-scene safety. Mount the lights as high as possible and allow for 360-degree visibility to compensate for the truck parked at any angle. When specifying traffic arrow devices, bigger is better! Mount traffic arrow devices as high as possible and preferably above the hose bed to maintain maximum effectiveness in most operating conditions, as seen in Photo 2. Consider mounting traffic directional devices on the side of your rig, too. This approach improves the visibility of the arrow when the rig is parked at an angle, as seen in Photo 3. Many emergency vehicles operate the arrow devices all the time. Remember the arrows are meant to be traffic control devices and should only be used to direct traffic around apparatus parked at emergency scenes. Many new rigs have adopted roll-up doors for rear and side storage compartments. Fire departments have come up with some very eye-catching graphics on these as part of the truck appearance package. In many cases these graphics are made with reflective material to improve safety. While the idea has merit, the actual performance of these graphics from a safety standpoint is suspect at best. Consider also putting reflective markings down low around the bottom of the apparatus and on fixed sections that do not move and won't be blocked by other apparatus features such as doors, hose or ladder racks. Some departments are using DOT-style red and white reflective conspicuity tape along the side rub rails to enhance nighttime visibility of their units. The North Washington Fire District in Colorado has slightly modified their NFPA reflective stripe along the side of their rigs to shape them like an arrow, as seen in Photo 4. When the truck is parked at an angle at an incident, the arrow shape can help provide direction to approaching motorists. However, if you mount the reflective markings too high, approaching headlights may not illuminate the graphics as well at night. This is another proactive strategy that can even be retrofitted on some existing apparatus. NFPA 1500 recommends fluorescent and retro-reflective warning devices such as traffic cones and signs and illuminated warning devices such as highway flares be used to warn oncoming traffic of an emergency operation. The Manual of Uniform Traffic Control Devices (MUTCD) designates florescent pink with black text as the recommended color for warning signs to identify temporary traffic incident management areas, as seen in Photo 5. Check with your state Department of Transportation to see if there are any different local regulations that may apply to the color and type of traffic warning signs in your area. 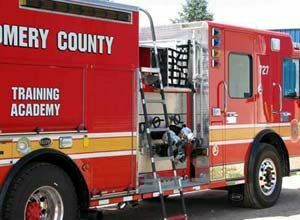 Warning signs, flares and cones can improve the identification of fire apparatus, personnel and work areas at an emergency scene. Flares used in conjunction with traffic cones with reflective collars can be very effective at channeling traffic around an incident. Cones should be orange in color with white reflective bands. For emergency services, the cones should be a minimum of 28 inches high and preferably 36 inches high, with two reflective bands. Although there are lime green cones available on the market, you should know that national standards (MUTCD) only recognize these cones for use in pedestrian walkways and that they are not appropriate for use in any kind of roadway application. There is no one perfect answer to how to prevent a struck-by injury or fatality, but there are plenty of proactive things we can do to help improve the odds. Remember that not all drivers are paying attention to where they are going and some are so impaired that no matter what you do they will not react properly approaching the scene. Never depend on signs, flares and/or cones alone to protect your personnel on-scene. Always position your apparatus to block the emergency scene work area. Finally, think about how you operate your various types of apparatus at different incidents. Consider the location of specific equipment on the truck and in the compartments. Develop response strategies to protect the pump operator from passing traffic while operating at fire scenes. Are your extrication tools located in the rear step compartment where your personnel will always be exposed to oncoming traffic when you respond to motor vehicle accidents? Could the tools be relocated to a more protected area of the rig? Have you trained your personnel to exit the truck on the side away from traffic whenever possible? If the design of your apparatus prohibits moving from side to side inside the rig, are personnel trained to watch for approaching traffic BEFORE they exit the rig? What can you do to improve rear-facing visibility for the crew compartment? Consider designing and installing small rear-facing windows for crews to see approaching traffic before opening cab doors, as seen in Photo 6. Even though you might not know exactly what type of incident you are responding to when you leave the station, you can be relatively certain that as you go on scene your personnel will be stepping out of the apparatus. When you exit the rig, you are in danger of being struck by a vehicle on any roadway and even in a parking lot. There is no one perfect answer to how to prevent a struck-by injury or fatality. But there are plenty of proactive things we can do to help improve the odds. Designing new apparatus and retrofitting existing rigs with some of the features outlined above may help improve your chances of returning home safely at the end of a run. Who's watching your back? Jack Sullivan served 25 years as an active firefighter and fire officer and currently serves as the Director of Training for the Emergency Responder Safety Institute, which can be found online at Respondersafety.com. Jack is a Certified Safety Professional and the Managing Partner of Loss Control Innovations, a risk management and safety consulting and training firm based in Richmond, Va. He studies roadway incidents involving emergency responders and works to raise awareness of this hazard and to develop proactive solutions for protecting emergency workers from being struck by vehicles while working near moving traffic. Jack is also an active member of the Safety, Health and Survival Section of the IAFC, the National Traffic Incident Management Coalition and the National Committee for Uniform Traffic Control Devices. To contact Jack, e-mail jacksull@mindspring.com.